"He announced on my birthday, on June 15, and I thought it was pretty silly at the time," Atamanuik recalled. Lots of reporters and commentators felt the same way. "But by August, I was like, 'Well, this guy's for real.' And I thought it would be funny to do him," the comedian said. Atamanuik's stock right rose along with Trump's. This year the comedian turned the Trump performance into a full-time gig, starring in 20 episodes of "The President Show" for Comedy Central. "It takes two hours to get into the makeup," he said in an interview with CNN. 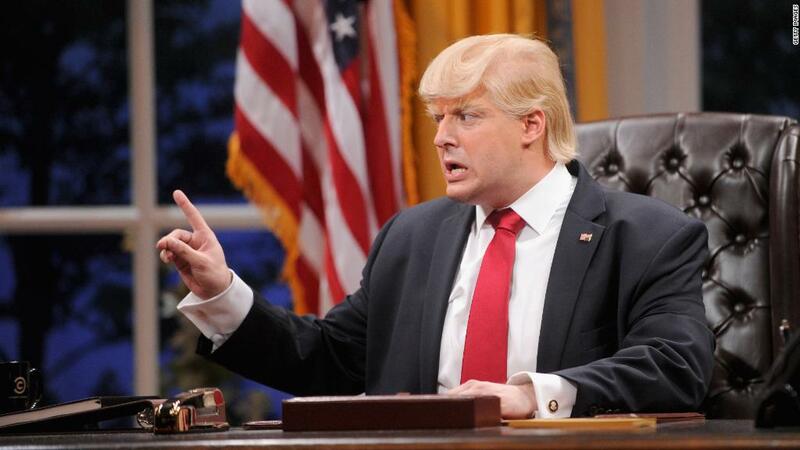 Atamanuik plays President Trump as the host of his own late-night talk show. He calls it a "hat on top of a hat on top of a beret." "We're a talk show that is from the perspective of Donald Trump, that he's hosting, but it's how he would host the show," Atamanuik said. "So the show is living in the zone of like a Steve Allen or Johnny Carson because that's Trump's zeitgeist." The approach can be summed up as "art political comedy," or "comedic activism," Atamanuik said. "We try to litigate him through his inner self." The first season garnered "yuuuuge" praise and strong ratings for Comedy Central. Later this month Atamanuik and the producers are taping a Christmas special to wrap up the year. It remains to be seen if Comedy Central will order a second season. Hear more from Atamunuik on the CNN Special Report "Late Night in the Age of Trump," Monday at 9 p.m. on CNN. Atamanuik clearly enjoys getting into character as the president. At this point he's almost a Trump biographer. He said he's learned a lot about Trump by watching tapes of rallies, "digesting his hand movements" and "getting into his mindset." "In the world that I live in, long-form improv, the idea is commitment. You want to commit fully," he said. To play Trump, Atamunuik said he has to "take him, learn him really well, and then repurpose him through my own voice." Trump is "lyrical," he said, and a "cyclical talker" who has "sort of a rat pack swagger." Physically, "he has no center of gravity. He is always pitched forward. And he holds his arms like a toddler, sort of at the sides." Atamunuik makes a lot of observations -- "that guy literally has zero introspection or inner thought" -- for someone who has never actually met the president. He argued that he doesn't need to meet Trump: "I think anybody can know that. Just watch him for five minutes." Oh, and Atamunuik doesn't think the real president would enjoy "The President Show." He emphasized, though, that his comedy is "not about just taking apart Trump." There is an empathetic layer to his version of Trump. "We want to take apart you guys," he said, meaning the news media. "We want to take apart the Democratic party. We want to take apart all institutions, not to destroy them, [but] to take them apart." Trump "is just a catalyst to a way of making commentary, hopefully, in a humorous way that relieves something and informs people. It's a part of our civilization that we do this." When asked what he will do, professionally, after Trump is no longer president, Atamanuik immediately cracked a joke: "Well, I mean, I'll probably put some stones in my pocket and walk out into the ocean." In a more serious tone, he added, "I've done a lot of work before I did Trump. Hopefully, I'll do a lot of work after."